Is VRBO safe? Is Homeaway safe? For those of you that want the short answer, yes it is, but only if you are careful and savvy at knowing when something is fishy. For those of you that want to make sure the vacation property you rent is legit, read on. First a little background. I have 4 properties listed on vrbo, I’ve been a member since 2008, and I have booked over 1000 reservations. VRBO is a good platform for connecting travelers with owners/managers, but lately VRBO is trying to act more like a travel agency or reservation site. VRBO and Homeaway try to purport themselves as some sort of pillar of security with catch phrases like “travel with confidence” and “book with confidence” and “guarantee”. They also now have a rating system for sellers, as if to give the illusion that they are keeping a watchful eye over what they think is their flock of sheep. 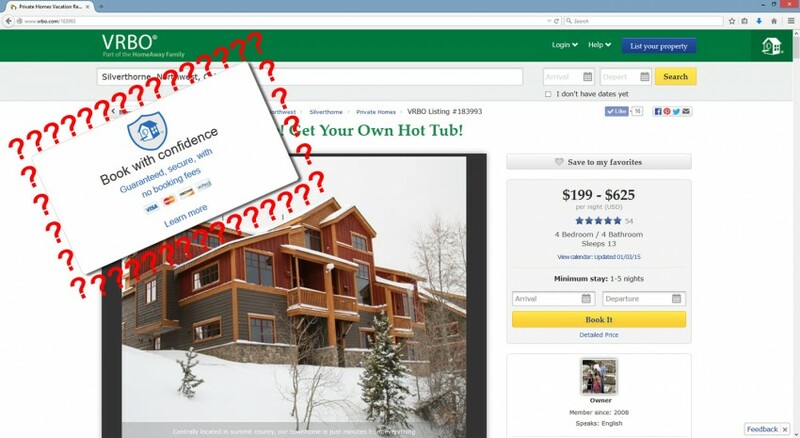 Truth of the matter is, VRBO and Homeaway are the ones who have been hacked and compromised repeatedly, not the owners subscribing to their service. Is VRBO Safe? Is Homeaway Safe? Now here’s my advice to travelers. Get to the owner! VRBO and Homeaway are only lead generation websites. Don’t give your credit card number to to VRBO or Homeaway. They are a big target and hackers know VRBO and Homeaway are gold mines full of credit card numbers. Use their platform to get to the owner who is most likely much more secure than VRBO or Homeaway. After all, it’s VRBO and Homeaway that have been hacked and compromised so many times, not the owners. Most owners have listings on their own site or other rental sites. Check those against VRBO to see if the availability matches. Make sure the phone number is identical on all the listings. Do a carrier lookup on the phone number and make sure it’s not one of those magic jack or google voice phone numbers. Fraudsters love Google voice and gmail. Beware of gmail or hotmail email addresses from the owner. These are not always fraudulent emails, but they are far less legit than something where the owner is obviously paying for email. Confirm by phone with the owner before you pay. Talk to the owner on the phone. Does this sound like someone you want to do business with? If not just hang up the phone. Don’t even say goodbye. If it is your first time booking with the owner pay using a reversible payment method like a credit card or paypal. Keep in mind that Paypal only allows disputes up to 45 days after the transaction. So if you aren’t arriving in 45 days then it’s better to use your credit card. Also I’d like to make you aware of a payment procedure I like to use sometimes that I like to call “double reversible”. This is when you pay with paypal using your credit card. This gives you the ability to first file a reversal with paypal. Then if that doesn’t work out you can do a reversal on your credit card. If offers two chances to get your money back. I would love to hear your questions or comments. Please comment below, and I promise to answer as fast as possible!